Our Las Palmas de Gran Canaria cruise port guide gives you information about the docking location, cruise dock, transportation options and much more! Welcome to the Las Palmas de Gran Canaria cruise port guide. We can find 380.000 inhabitants in Las Palmas. This city is on the island of Gran Canaria which is part of the Canary islands just off the coast of Morocco. 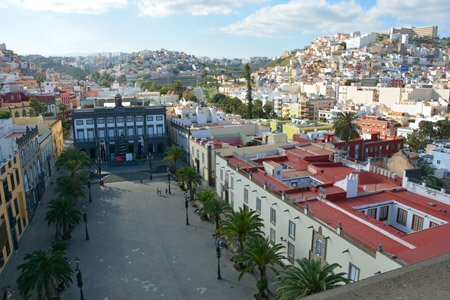 Las Palmas, together with Santa Cruz, is the co-capital of this group of islands. It is a rather big city, even if you would compare it to the mainland. It is the 9th largest city of Spain and even the largest city of the European Union lying outside the European continent. Its identity could at first be compared to the mainland, but take a closer look and you will discover a whole new culture. The city is defined by its gorgeous historical old town and the local products that are produced all over this part of the island. Las Palmas is the largest city on the island of Gran Canaria. This island is often called the miniature continent due to the different climates and variety of landscapes. A 3rd of the island is under protection of UNESCO. The north tends to be cool while the south is warm and sunny. The east coast is dotted with white sandy beaches and the west coast is much rockier. Tons of things to see and do in and around Las Palmas. Read what your options are in the Las Palmas de Gran Canaria cruise port guide. – Cruise ships usually dock at Santa Catalina Pointe in Las Palmas de Gran Canaria. – The Las Palmas cruise dock is right in front of the city center. – The cruise dock is next to a big shopping mall El Muelle. – Lots of transportation options are offered at the cruise terminal like: hop on hop off bus, taxi and public transport. You will find this sign in at the cruise port of Las Palmas. It gives you an idea of the taxi prices on the island. These prices are not fixed, you can still negotiate. There is 1 central terminal building in the middle of all the docks. It is not used for anything special, but it does offer free wi-fi. 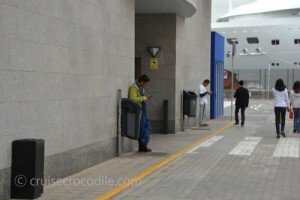 We do recommend though to walk over to the El Muelle shopping mall in front of the cruise ships, because they also have free wi-fi here. The cruise ships usually dock at Santa Catalina Pointe. This cruise facility has quite some capacity. At most 5 cruise ships dock here at the same time. There is no terminal building and limited facilities available on the dock. There is usually a tourist information representative that comes to the pier. You will find a car rental and taxi stand at the cruise port. 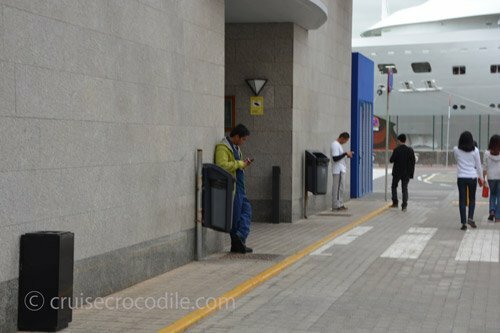 When you walk out of the port area you will automatically come across shopping mall El Muelle. This shopping mall has lots of places with wi-fi and nice shops. It is a great facilities to have so close to the cruise dock. Walk a little bit further and this is where you will see the actual tourist information booth (see map above). This is where cruise independents can arrange all kind of things. Take horse carriage ride, hop on the sightseeing bus, take the local transportation or grab a taxi. If you are not quite sure what to do it is wise to go by this booth to make a plan. The docks are right in front of the city centre of Las Palmas. As soon as the exit the port you are in the heart of Las Palmas. The old town, Vegueta, is 6 km to the south. To get here use bus 12 or taxi. The official taxis are white and they have a meter. For a ride from the dock to the old town you could expect a price of 6 euro (if you can make him run on the meter). 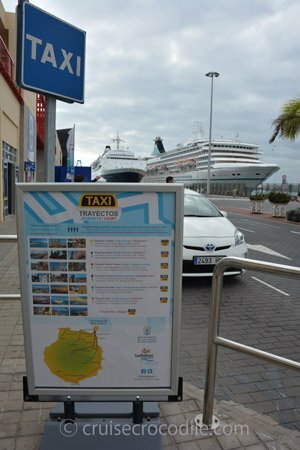 Taxis at the Las Palmas cruise port are also experts in giving taxi tours. Expect the taxi price is between 25 and 30 euro per hour. City tours cost around 80 euro and a taxi tour around a part of the island of 4 hours should cost about 100 euro. No need to plan ahead what you want to see, they have fixed taxi tours itinerarys on display on the sign in the port and any taxi driver in Las Palmas knowns the good places. This service is available in Las Palmas. It is offered in front of the Muelle Shopping Mall. Keep in mind this bus just stays in Las Palmas. 15 km west of the port we find the small town of Arucas. In the middle of the banana plantation we find this charming village. Find lots of tiny boutiques and quaint streets here. The eye catcher or the town has to be the church of San Juan. When you look at this cathedral you can’t help but wonder if Gaudi had anything to do with it. The answer is no. Although it is worth to learn about its history inside the church. This house is a museum dedicated to Christopher Columbus. It claims it was the very house that Christopher Columbus stayed in while one of his ships was being repaired back in 1492. Inside you will find 13 permanent exhibition room, a library and study centre. 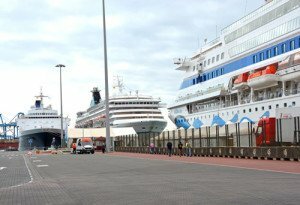 The cruise ships all arrive in the new town of Las Palmas. The old town is about 6 km to the south of the dock. The old town is what we call Vegetal. Find all kind of historical sites and a beautiful neighbourhood here. Visit the Columbus Museum or Santa Anna church for example. Rum distilling is one of the most important industries on Gran Canaria. The factory is now partly a museum where you get to follow the whole process from A to Z and also get to taste the many different rums they have. Find the distilleries 16 km west of the dock. This museum is dedicated to religion and religious art on Gran Canaria. It houses all kinds of work from the 15th century onwards. It is located in the south wing of the Santa Ana Cathedral in old town Las Palmas. About 6 km away from the ship. There is a tourist information booth at the exit of the port (see map above). Visit the representatives here for any kind of information or brochures. From here you can start your journey on the island. Bus 12 is the bus to use to either get to the old town or to get to the bus station where you can catch the bus to go further afield. See on the map above where to catch bus 12. This is one of the 3 beaches in Las Palmas. It is a 3 km long beach that is absolutely well though out. It is one of the most popular beaches on the island and it attracts numerous tourists and residents. Take a walk along the beautiful promenade here, watch the people, admire the art work and go for a nice drink. At the port of Las Palmas you will find an Avis car rental at the terminal. It is wise to prebook something online to make sure you have something waiting for you on arrival. If you are planning on visiting the old town in Las Palmas be sure to visit the Santa Ana Cathedral and do not miss out on the elevator ride to the top. This is where you get panoramic views like this over the city of Las Palmas. You will find this shopping mall in front of the cruise docks. Find wi-fi and lots of stores here. It is open 7 days a week. 58 km to the south of the cruise port in Las Palmas you will find the famous Maspalomas beach. The dunes form an amazing landscape that will make a perfect day for an adventures hike, camel ride of day at the beach. The Las Palmas cruise port is the main cruise port for the island of Gran Canaria. 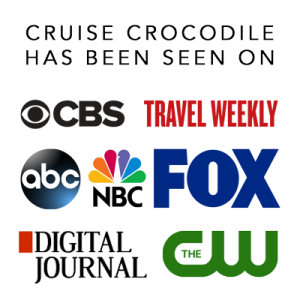 You will find lots of facilities at the cruise dock and the nearby area. Read our full Las Palmas de Gran Canaria cruise port guide for all the information you need when going on cruise to the Canary Islands. Visit the Bandama Crater just south of Las Palmas. From here you will have incredible views over the island and you pick up your local souvenirs here.